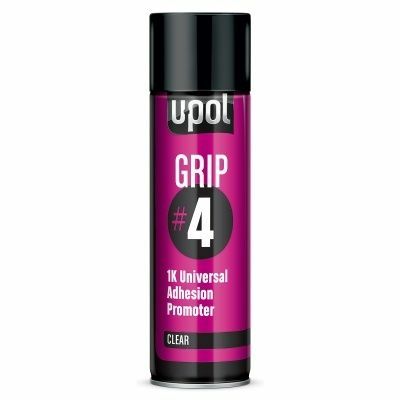 U-POL Aerosol Grip 4 Adhesion Promoter 450ml. 1K, clear, ready to use universal adhesion promoter in an aerosol. Acts as a tie coat - promoting uniform adhesion to repairs containing different surfaces. Grip #4 packaged in an aerosol is quick, easy & convenient to use, it enhances adhesion to all auto body surfaces - plastics, aluminium, painted surfaces, galvanised sheet, zinc, fibreglass & bodyfillers. Maximises adhesion to repairs containing different surfaces and promotes adhesion around areas that are difficult to access & abrade (door handle recesses, bonnet struts, scuttle grills & bumper groves).